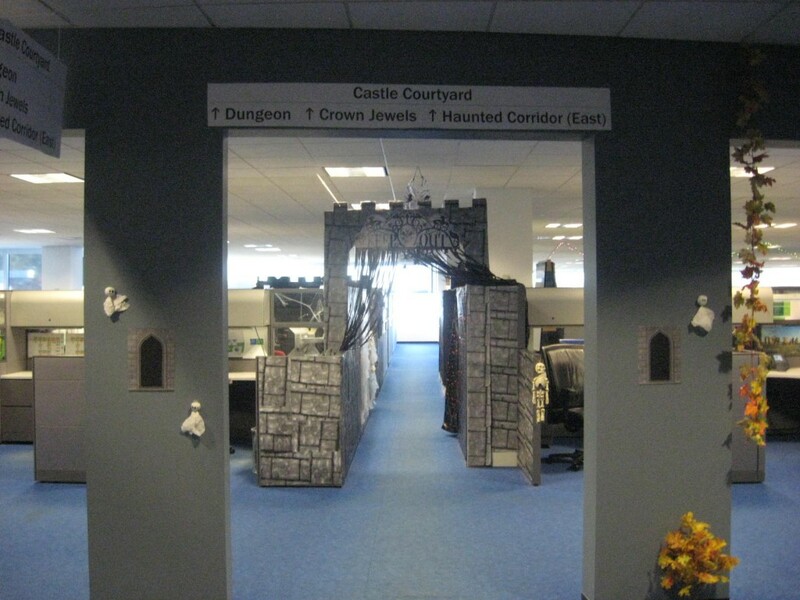 Every year, on the Friday before Halloween, my employer opens the building up for employees’ children for Safe Trick or Treating. We also have a day care center on-site, so most of the children are very little. 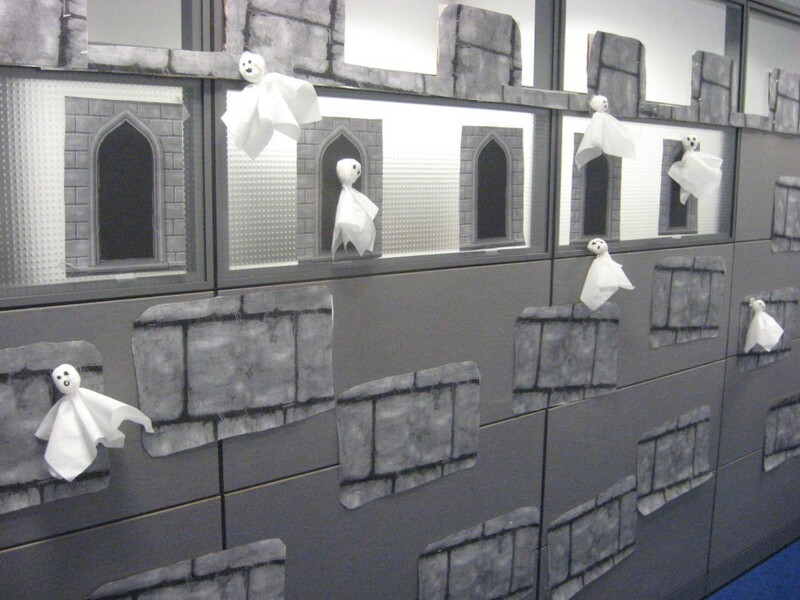 Every year, we employees go just a little nuts decorating the cubes for the kids. I don’t know who likes it more – us or them. 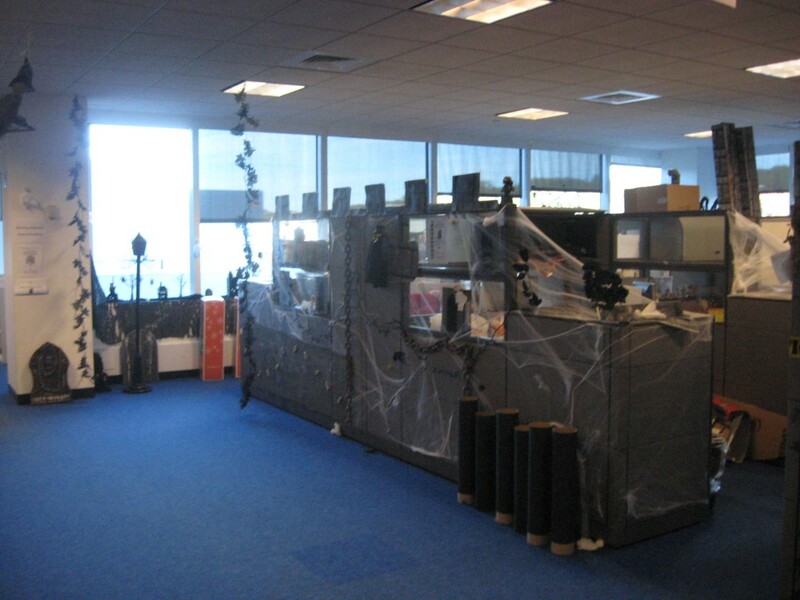 I was er, drafted, about three years ago to decorate our space even though my kids are long past this age. I took up a collection, went shopping and stayed after work one night to decorate. That year, we did a Candyland theme. I bought huge sheets of construction paper and stapled them to the carpet to make the game board. The next year, we did Alice in Wonderland. 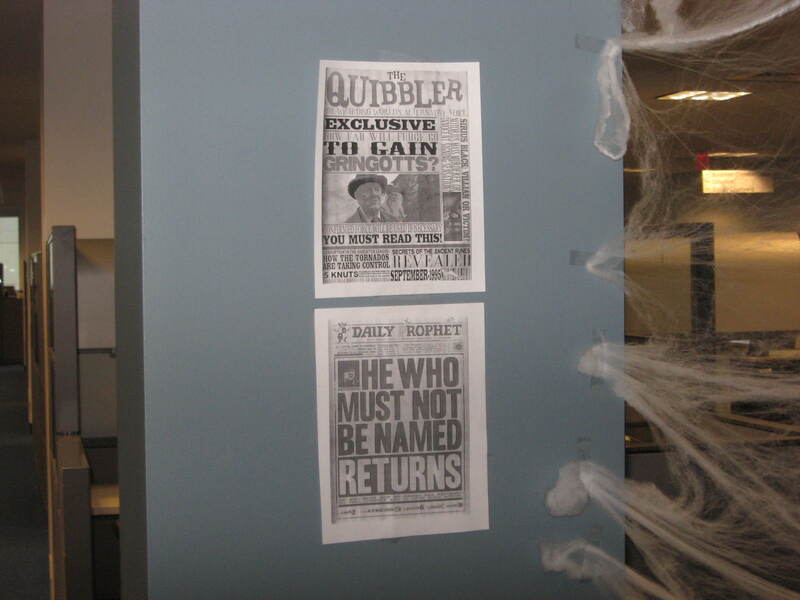 This year, we did Harry Potter. 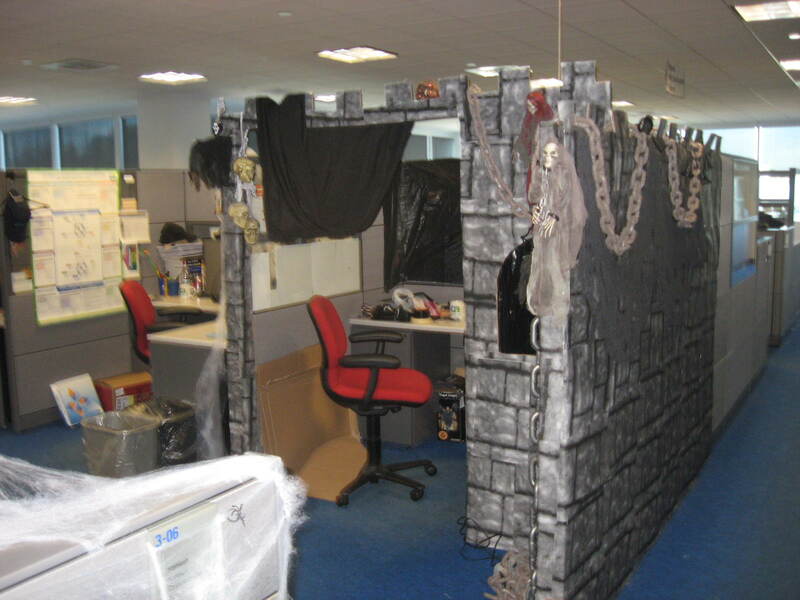 It meshed well with what our neighbors across the floor decided – they went with a Haunted Castle theme. 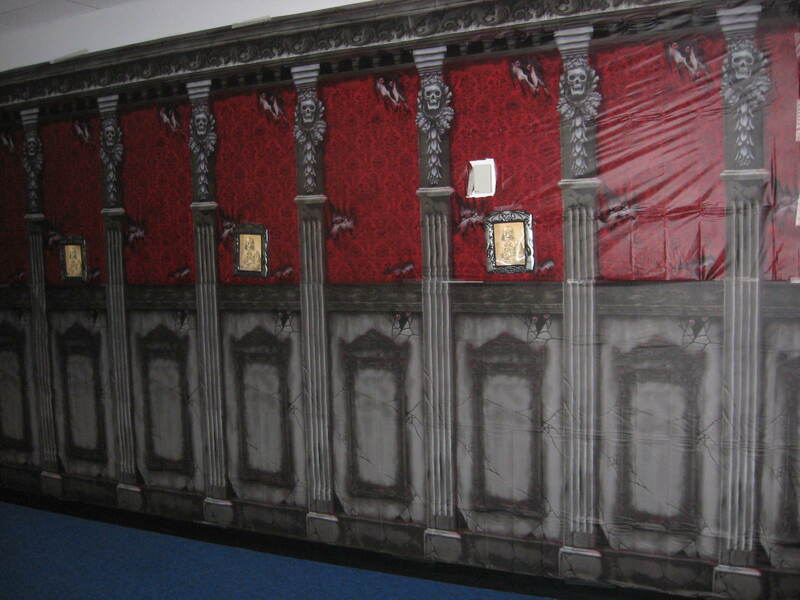 Hogwarts corridor - Wow, was it HARD to hang this stuff. Scotch tape didn't work so we used masking tape. 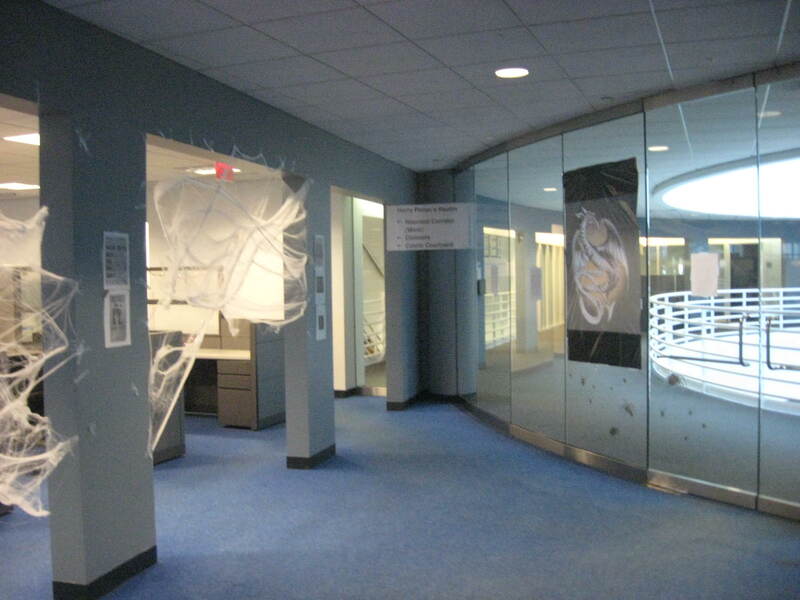 See the spiders on the glass door? There is also a HUGE one on the ceiling, but it keeps falling down. 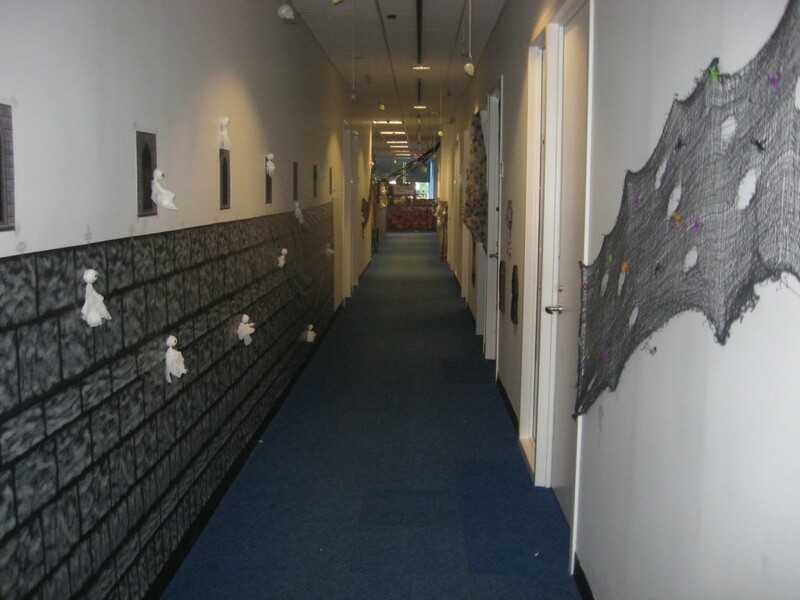 The spooky corridor to the north side of the floor. 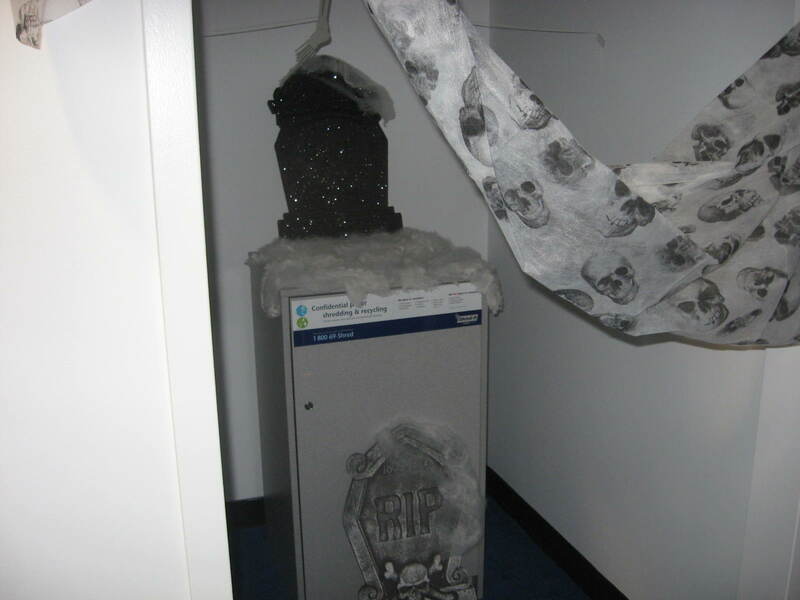 Even the office shredder got into the spirit. The loot. Don't worry. It's under guard or I'd have eaten it for breakfast by now. I’ll update later when the kids arrive. 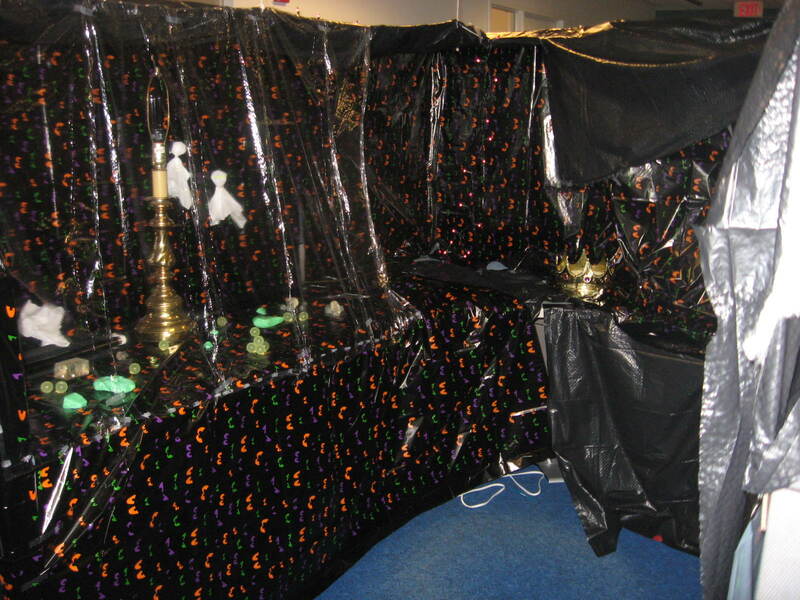 I visited the fourth floor, where these imaginative colleagues decorated their entire area as a pirate ship. And then, I found Indiana Jones. 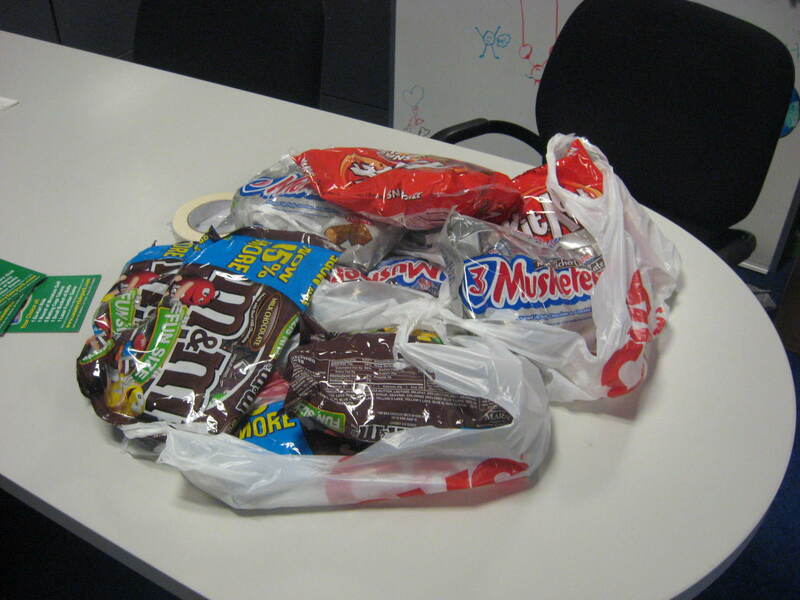 I FOUND ALL THE LOOT! Oh, this looks wonderful. 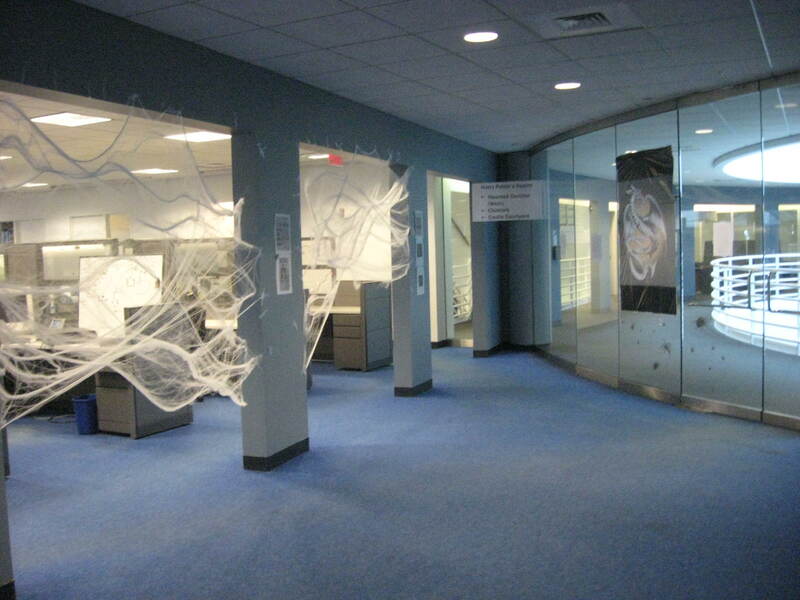 Points to your employer for opening up the building, and to you and your colleagues for all the decorating!